117 The Waxworks, Rathborne Village, Ashtown, Dublin 15, D15 W426. Baxter Real Estate are delighted to present to the market, this modern, 2-bedroom/2-bathroom, fourth-floor apartment, which occupies an area of approximately 77 sq.m./829 sq.ft.. On entering, you are greeted with a hallway, with storage cupboard, which leads to an open-plan living/dining/kitchen living space. The living/dining area has laminate flooring, whilst the kitchen has a tiled floor. The kitchen area has fully-integrated appliances and ample storage units. From the bright living area, there is access to a private balcony which overlooks the surrounding countryside. The master bedroom features built-in wardrobes and a carpeted floor. It is also further enhanced by having a fully-tiled en-suite bathroom. The second bedroom also features built-in wardrobes and a carpeted floor. A spacious, fully-tiled bathroom completes the accommodation. 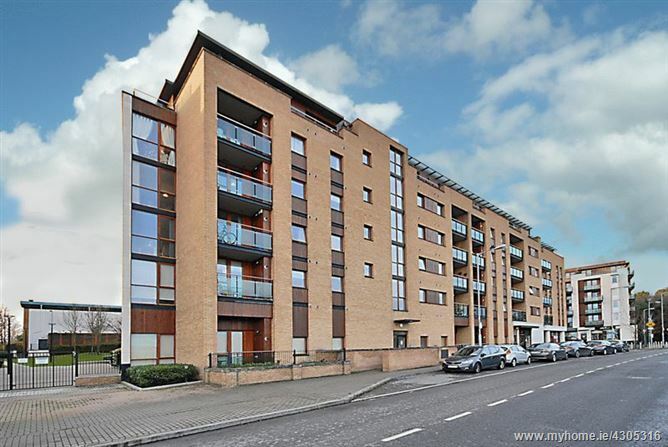 The Waxwork Building is a modern development conveniently situated beside Ashtown Train Station, which provides a a regular train service to Dublin city centre. A bus route to the city centre also serves this area. Rathborne village itself is well-serviced by eateries and shops, including a SuperValu. It is also only a short walk to the beautiful Phoenix Park, which hosts numerous recreational activities. Please note that all information, including areas, is given for guidance purposes only. We have not tested any appliances and all parties must undertake their own investigation into the condition of these appliances. Living Room - 14' 5'' x 12' 0'' (4.40m x 3.66m) - Laminate floor and access to a balcony. Kitchen - 8' 2'' x 7' 1'' (2.50m x 2.17m) - Tiled floor. Master bedroom - 12' 5'' x 11' 5'' (3.78m x 3.47m) - Built-in wardrobes and a carpeted floor. Bedroom 2 - 15' 7'' x 8' 6'' (4.74m x 2.60m) - Built-in wardrobes and a carpeted floor. Bathroom - 8' 0'' x 6' 1'' (2.43m x 1.85m) - Fully tiled.